It’s just so different. It’s a magical, watery world where roads are replaced with canals and cars are replaced by boats. Where else in the world can you see something like Venice?! I love getting lost in the quiet backstreet canals and sitting with a slice of pizza in one of the picturesque squares. I love listening to the sound of gondoliers singing songs as they glide down the busy Grand Canal. I love the emerald green colour of the water, and the beautiful Venetian architecture. Yes Venice is definitely my favourite. Finding cheap accommodation on the islands is really hard to come by, especially in the height of summer, and if you must stay close to the sights, you might want to check out holiday apartments. If you’re traveling on a shoestring budget and you don’t mind staying further afield, you’ll get a much better price. My friends and I left it till last minute to look for accommodation and there isn’t a lot of choice when it comes to hostels. Things were either fully-booked, had poor reviews or only had all-female dorms (we had a male in our group). We ended up staying at a camp site called Camping Fusina about a 40-minute bus ride from Venice-Mestre train station. While it might seem far away, there was actually a daily ferry across the water to and from Venice. It was quick and easy, and only took about 20-minutes. We went sightseeing in Venice all day, and then spent our evenings at the camp site, where there was actually really good on-site nightlife. The cabin we stayed in was very clean with a nice en-suite bathroom, so don’t be deterred by the word campsite and assume you’ll be sleeping in tents! I visited Venice at Easter time, and so it was very, very crowded. There were two cruise ships in, which meant there were crowds of people everywhere and believe me, those narrow streets can get very very stressful indeed. 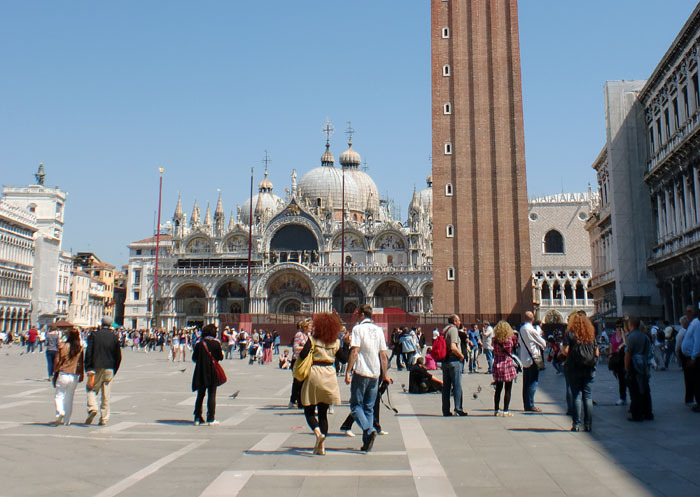 The busiest times for tourists visiting Venice are from Easter right through till the end of summer in September/October. If you want to avoid all the tourists you’ll need to go in the off-season. Venice can also experience acqua alta (flooding), caused by abnormally high-tides and heavy rainfall, which causes the canals to overflow. Acqua alta most commonly occurs in October, November and December so if you’re traveling in these months, it would be wise to check the tides and forecast on the internet before you go. If there is possibility of acqua alta, you might want to take some wellies (gumboots for you Americans) with you! Seriously, I had a map of Venice with me, and apart from giving me a general idea of which districts the sights were located in, it proved to be completely and utterly useless. Venice is an absolute maze to navigate, so throw away the map and use your instincts. Let yourself get lost and you can find yourself in some very pretty backstreet canals away from the hoards of people. Like most places in the world, if you try and order a cup of coffee next to the most famous attraction, prices are likely to be much higher. When in Venice, stay clear of having coffee at Piazza San Marco if you’re on a budget. For cheap, really good coffee, stop in one of the little backstreet shops and order an espresso standing up at the bar. The same applies with food. 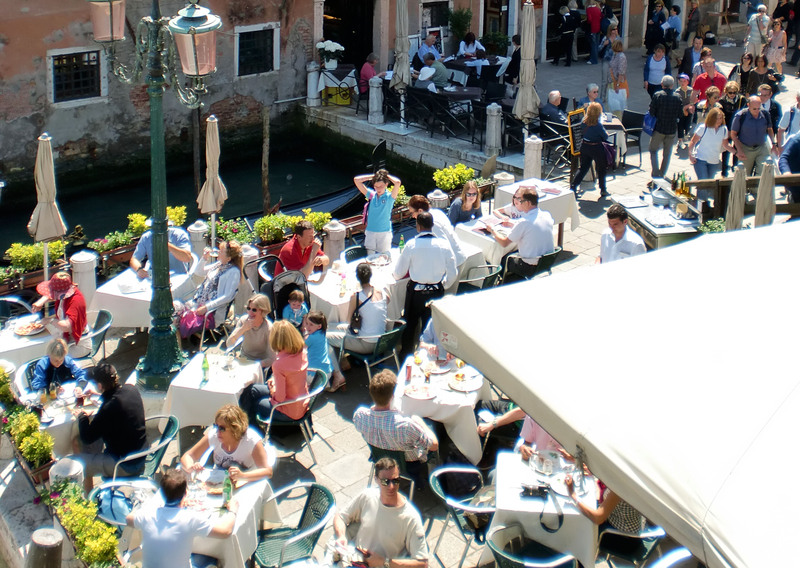 If you want to eat in Piazza San Marco, you’re going to pay far more than restaurants further away. I’m not saying you shouldn’t do that- it’s always nice to treat yourself, but if you’re trying to save some Euros then opt for a delicious slice of take-away pizza and eat it sitting on a bench in one of Venice’s beautiful squares. I previously wrote this article about whether a gondola ride is expensive or not which gives you a guide on how to choose a gondola. You can definitely bargain hard and haggle over a price. Consider trying to learn Italian online first so that you can naturally converse. 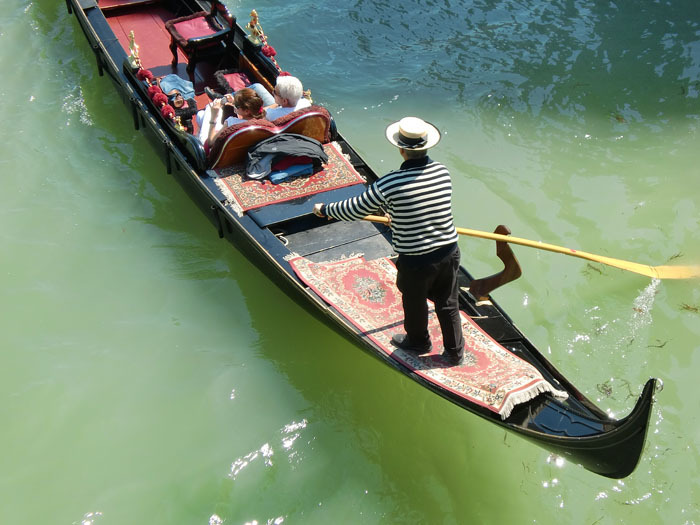 Don’t take the first gondola you see, ask different gondoliers and see if you can get a decent deal. There are lots of gondolas by the pier at the end of Piazza San Marco, but I would avoid these and find one elsewhere if you don’t want to pay over-the-odds. Since gondola rides are charged per gondola seating a maximum of six people, it’s better if you have more people in your group, then you can divide the cost. The ‘official guide price’ from the website for gondoliers www.gondolavenezia.it is €80 for 40 minutes at the time of publishing, but prices will vary according to the length of time, the sights you want to see, and whether you want your gondolier to sing songs or play the accordion. It is also more expensive for an evening gondola ride.